Madison Douthitt, AmeriCorps coastal community engagement specialist for the federation’s Wanchese office, has spent a lot of time educating students in Dare, Currituck and Hyde counties about oysters, marine debris, clean water and more. Check out this update of what she’s been up to. Madison Douthitt, AmeriCorps member with the federation’s Wanchese office, has led many lessons this summer at various camps and community events. Douthitt had the opportunity to visit Hyde County three times this summer — once to lead an activity at the Hyde Seek and Discover Camp and twice to visit the 21st Century Community Learning Centers Program. The 21st Century Learning Center was leading camps with different themes for kindergarten through 11th grade students. Douthitt’s first visit was during the camp’s Water Works week. Using shoreline model bins, the students explored the different shorelines and determined which shorelines had the most and least amount of erosion from wave action. She finished up the visit by explaining how oysters improve water quality, discussed their life cycle and taught the group about the federation’s shell recycling program. Douthitt’s also led lessons during the camp’s Aquatic Life week. She picked up where she left off on her previous visit by discussing oysters and their life cycle. Each student was given a necklace which had the juvenile form of an animal on their front and the adult form of the animal on the student’s back, and the students had to determine what kind of animal they had. “I really enjoyed having the opportunity to visit Hyde County this summer because I had not been able to during the school year. The students were able to make great connections their community through the lessons,” Douthitt said. Douthitt has also spent a lot of time this summer participating in various summer camps. On June 21, she visited the Dare County Department of Recreation’s tennis camp to give a lesson on the water cycle. The campers discussed clean water, where they find water along the Outer Banks and the main components of the water cycle. They then moved between different stations that represented different locations that water is held in the water cycle. As they traveled along the water cycle, the campers mapped their path. Each group shared their journey as a water drop with the rest of the group at the end of the activity. Campers from the North Carolina Aquarium on Roanoke Island get a closer look at oysters. On July 11, Douthitt traveled to WestSide Athletic Club in Currituck County to meet up with another tennis camp. 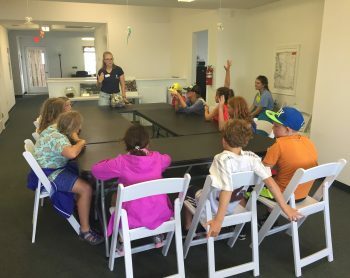 They participated in an activity where each camper had an item of marine debris and they ordered themselves from most- to least-commonly found, and were surprised to learn what items are most common. 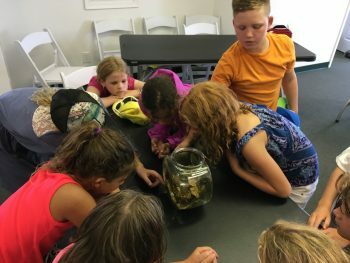 On July 12, the North Carolina Aquarium on Roanoke Island brought their campers down to the Wanchese office to discuss oysters and how they improve water quality in the sound. The campers learned about the Coastal Federation’s living shoreline projects and oyster shell recycling program. Douthitt also discussed the life cycle of an oyster and the habitat that oyster bags provide. She took a bag out of the sound, put the oyster shells in a fish bowl and left any other animals living in the bag in a bucket. The campers investigated the fish bowl and found barnacles, clams, crabs and shrimp living on and in between the shells. The federation’s AmeriCorps members in the Wanchese and Wrightsville Beach offices work to educate the public about environmental conservation, with a special focus on underserved groups. Learn more about them here.